Children, baking, yoga, ballroom and books – rewarding ways to spend your time. Easter is a wonderful chance for families to spend time together but I have to admit that I struggle with the massive amounts of chocolate given to children. Although close family don’t give us chocolate eggs we still seem to end up with quite a few. In true hippo-critical fashion that pretty much means more for me. I want my children to enjoy Easter but I won’t give them massive amounts of sugar. 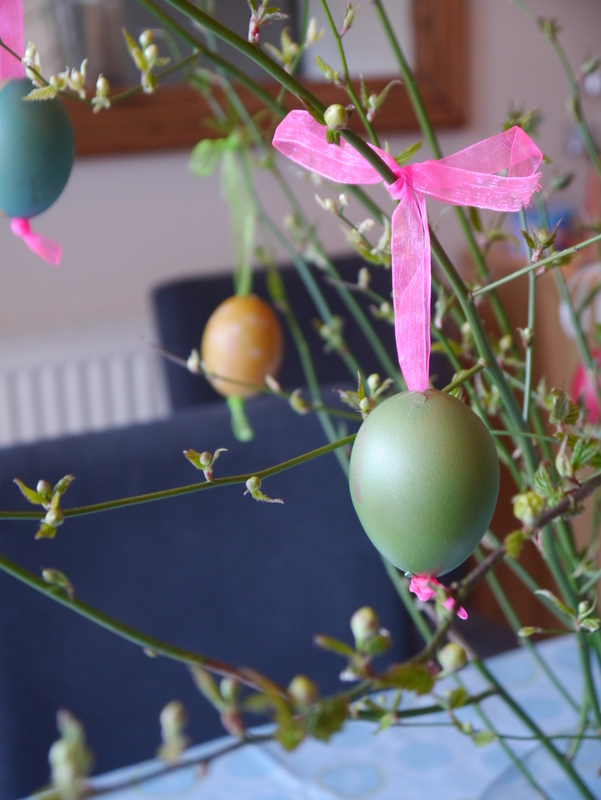 We have an egg hunt on Easter morning with a very limited number of small eggs and try do do other things to make it special. 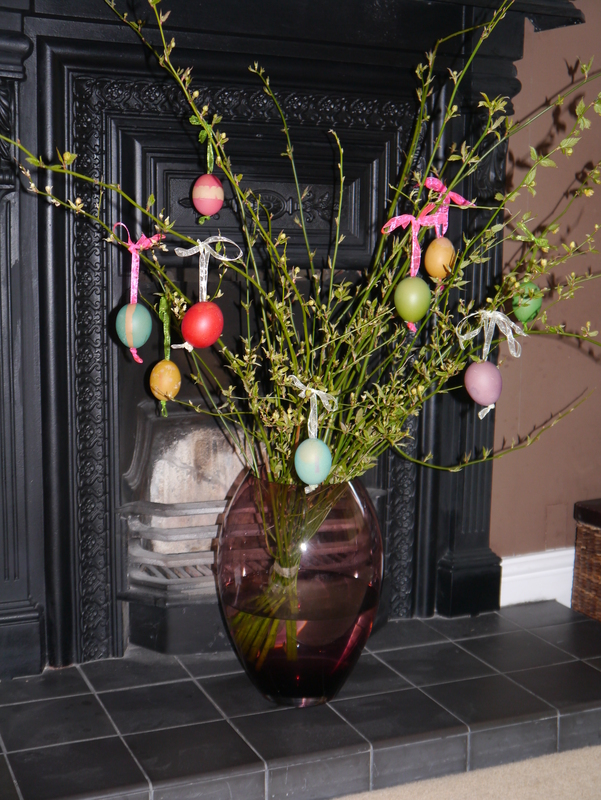 Easter Friday this year was spent making and “Easter tree” a german tradition that I vaguely remember my mum making one year when I was little. 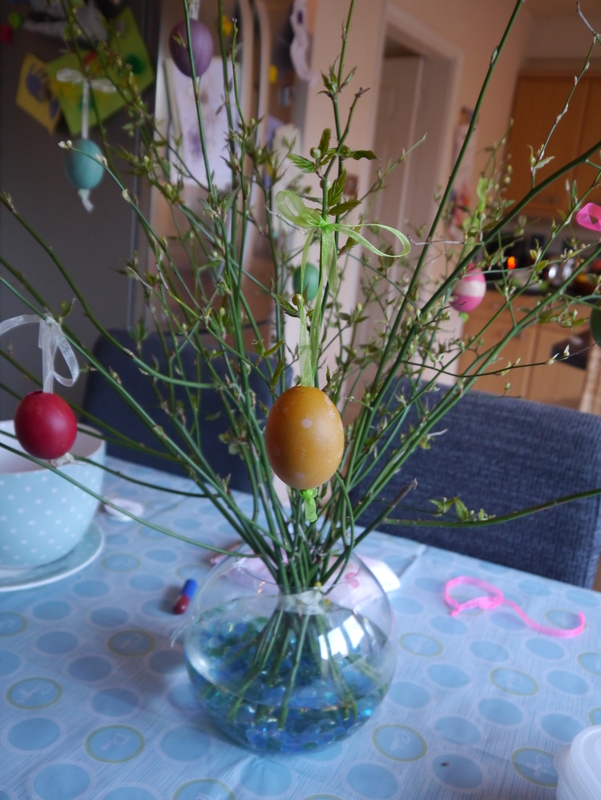 For the month up to Easter if I was making anything with eggs for the family I blew out the eggs instead of cracking them, meaning we ended up with about a dozen hollow egg shells (after breakages) to dye. 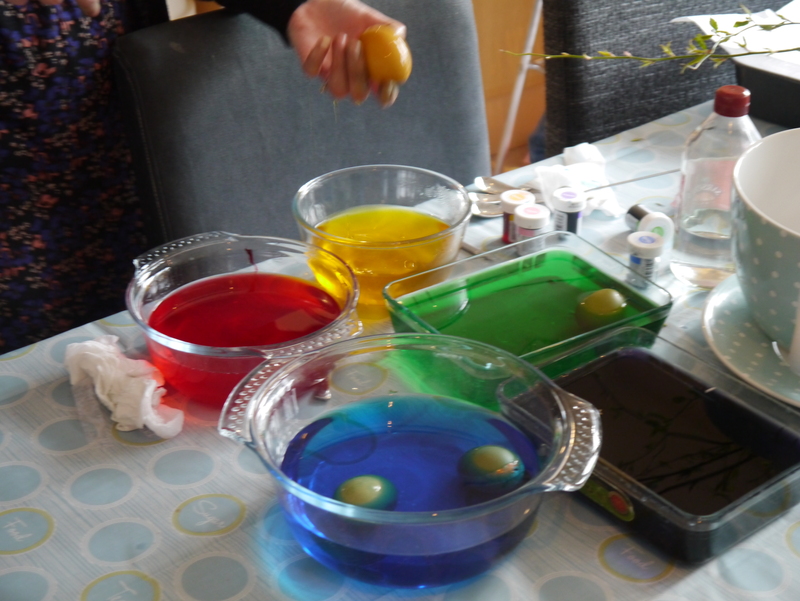 It’s a simple enough process – warm water, vinegar and food colouring. 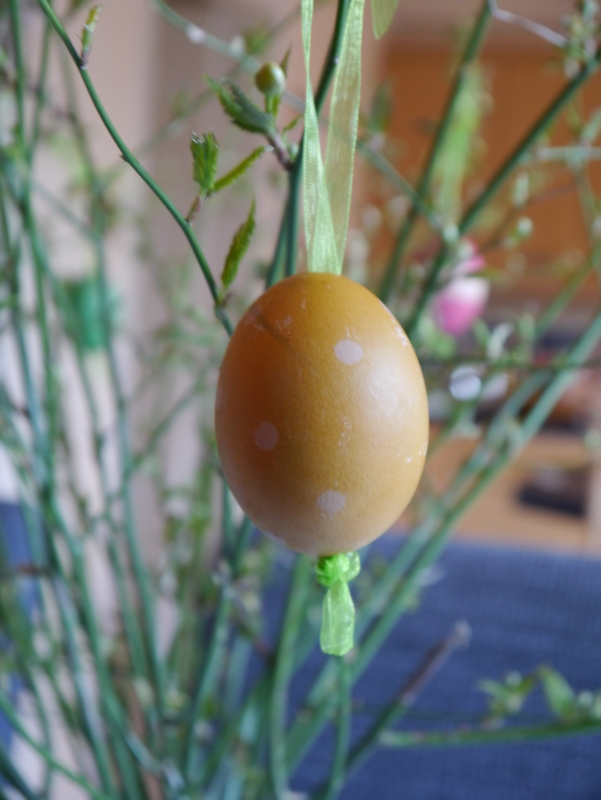 I thought this would be a great thing for the kids to get into and we tried putting stickers and sticky tape on some of the eggs to make patterns. They very much enjoyed making the eggs, although as the water was quite hot the couldn’t join in as much as I originally hoped. 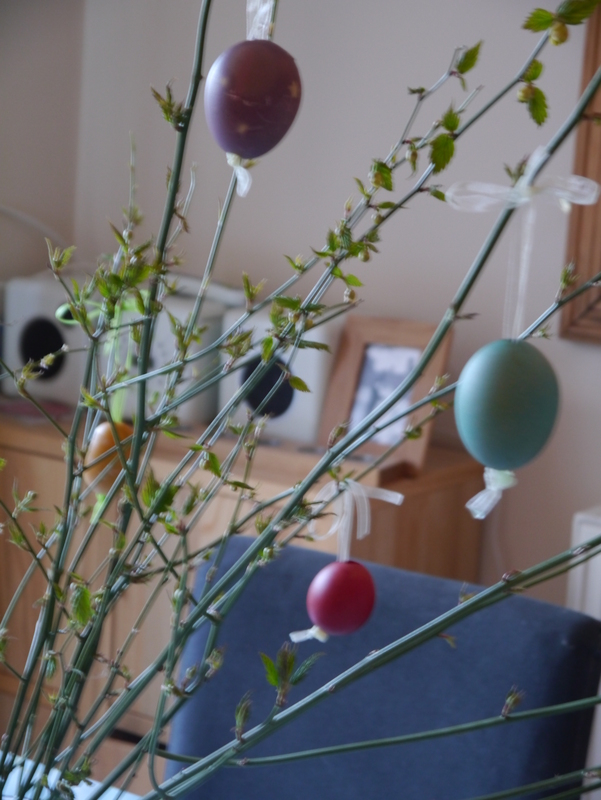 We strung our eggs on brightly coloured ribbon and hung them from a “tree” which was really branches cut from one of the many overgrown bushes in our garden. (Our house’s previous owners were very keen gardeners who left us with a lot of lovely bushes and trees. Unfortunately the extent of my gardening involves cutting them all back twice a year). I have to admit to being pretty impressed with the results, although the original vase turned out to be too unstable meaning the final result was the picture below. The tree lasted for a week and a half and according to my three year old one of the eggs cracked and there was a lovely baby bird inside. The yellow flowers came out in the heat and looked great, every year I cut back this bush and think what a waste it is of beautiful flowers, so it was nice to get some use from them. 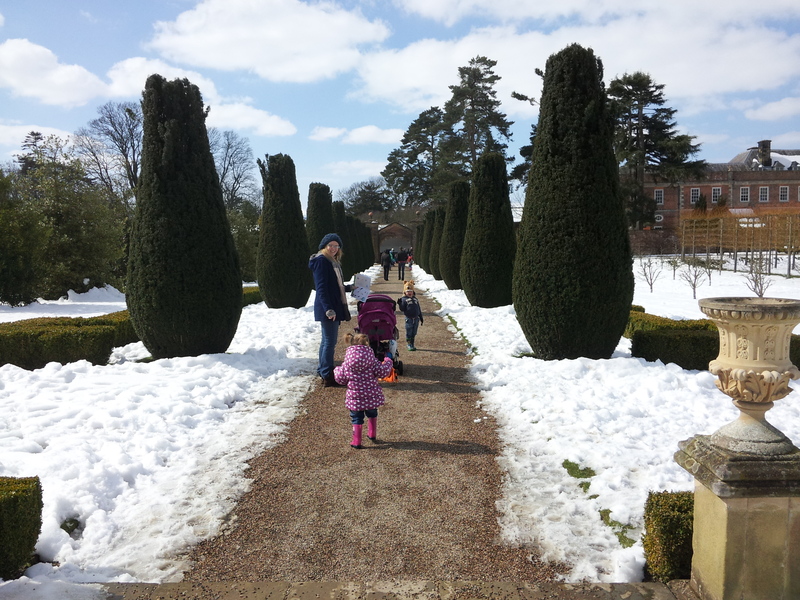 To finish off the weekend we went on an egg hunt at Erddig, a National Trust property in north Wales which runs one of the Cadbury Easter trails each year. In previous years we’ve gone to this event and picnicked on the grass in glorious sunshine while children played football around us. This year was a little different due to the late heavy snows. As we drove nearer the world got whiter. By the time we arrived there were banks of snow on the sides of the road. We had a lovely time searching for hidden nests and identifying which bird layed which eggs, but stayed well wrapped up and headed off for coffee and cake paninis at a local Starbucks as soon as we had finished.